PLEASE TAKE THE TIME TO THOROUGHLY READ THE POST BELOW ALL THE WAY TO THE BOTTOM. USE the notes you took during class and the handout I gave you near the end of class which covers all the steps I went through. There are also handouts and video links below to help you complete the project. IMPORTANT!!! Only create the patterns and the line drawing for the figure. PLEASE DO NOT PLACE THE PATTERNS INTO THE FIGURE DRAWING UNTIL I GO OVER THE SPECIFICS IN CLASS. 1. 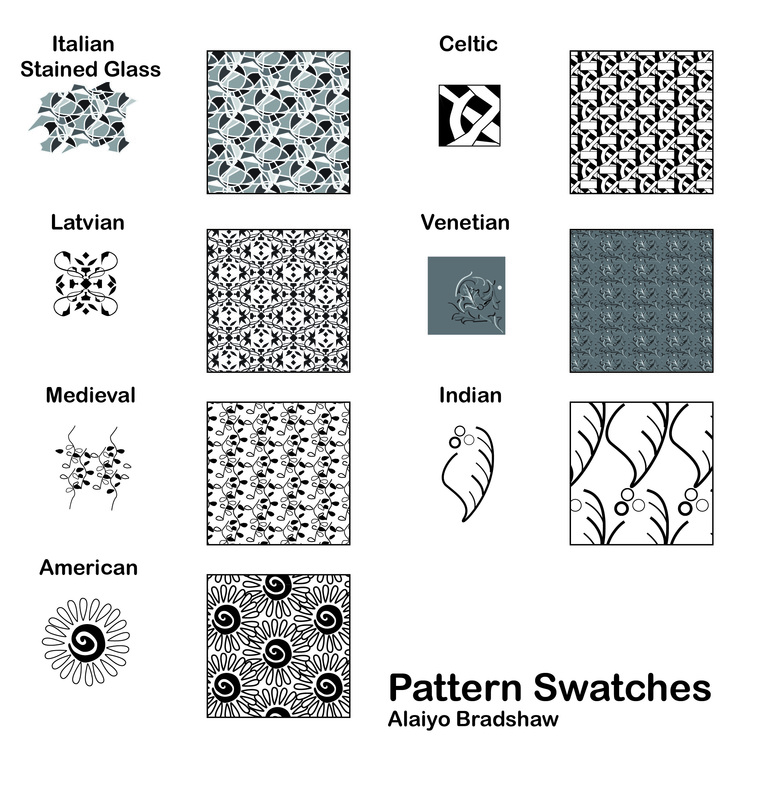 Finish the 7 Pattern drawings in one Illustrator document, use seven layers, one for each pattern. Save the document as (patterns_student name_di_sp18.ai). Draw from your hand drawn designs inspired by the patterns you found. Create, name and save all swatches in your swatch pallet. Please, use the template I provided to you or another you design on your own. Have the original portion of the pattern (swatch) you drew in Illustrator neatly placed next to the square with the patterns filled in. The purpose of doing so is to help you see the size of the pattern in a shape to note if you need to scale it down or not. Use type to label the swatches with the names of the cultures you chose. 2. In a separate document, have the figure drawing scanned and placed in Illustrator. Leave the lines as they appear in your hand drawing or complete the line drawing in Illustrator. 11″x17″ (tabloid) sized paper (Pattern_Man_Student Name_di_sp18.ai) Please do not add in the patterns. 3. View the Digital Reference Videos posts on the bottom of the page for Rotation Tool and Making, Scaling, Copying, Saving, Filling and Editing a Pattern (A MUST SEE!!) Watch this video all the way through. It tells you how to reduce your patterns, so they show up smaller in scale along with other editing possibilities for your created pattern. ILLUSTRATOR TOOLS: Use pen, pencil, selections, shapes, curvature, brush, Pathfinder, Shapebuilder, rotate, reflect, regular brushes, gradient, variable width and more. Create patterns with solid grays or black backgrounds with light lines on top, a variety of gray lines, a variety of line thicknesses in one design, gradients, etc. Do your best to create variety. Get as far as you can. If you get stuck, please ask me questions and send me your ai file to review. I will also help you during class on Monday, but you will need to have the homework completed. This entry was posted in Assignments, Digital, Illustrator, Referenced student work, Scanning, Sketchbook and tagged Illustrator, line, pattern, pen and ink, sketchbook. Bookmark the permalink.